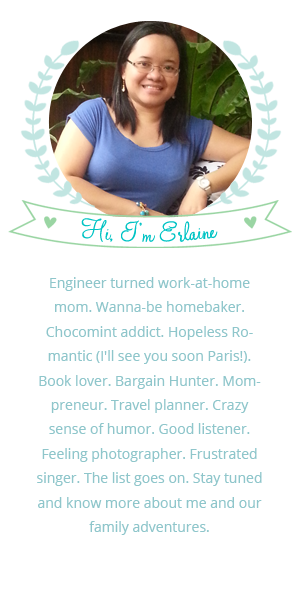 24/7 On-Call Work-At-Home-Mom. 100% Pure Love. This is Zane’s birth story 🙂 For 8 years, it has always been the three of us – me, Mark and Kelsea. It was our plan not to extend our family for awhile like 4 or 5 years so we can focus on our daughter and prepare for financial stability. But it was already more than 5 years when a lot of relatives and friends are already asking “hindi na ba susundan si Kelsea?” Still, we weren’t ready yet. So last January 2016, we started trying to conceive. I was turning 36 mid of that year. We thought it would be easy but a lot has changed especially our body because of our age. 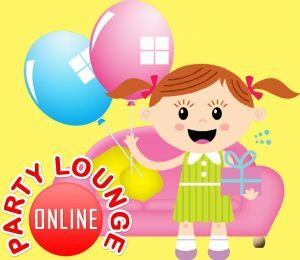 When I turned 36, I became a little worried because I wanted to give birth again soon so that there will be less risks due to my age. 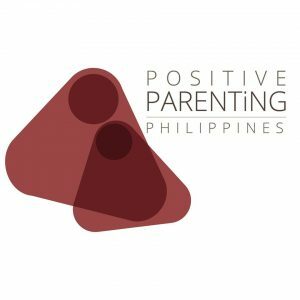 That’s when I decided to attend Pinay Doulas Collective‘s fertility workshop last June 2016. I learned a lot about my own body, fertility, ovulation and did some lifestyle changes (diet + exercise). 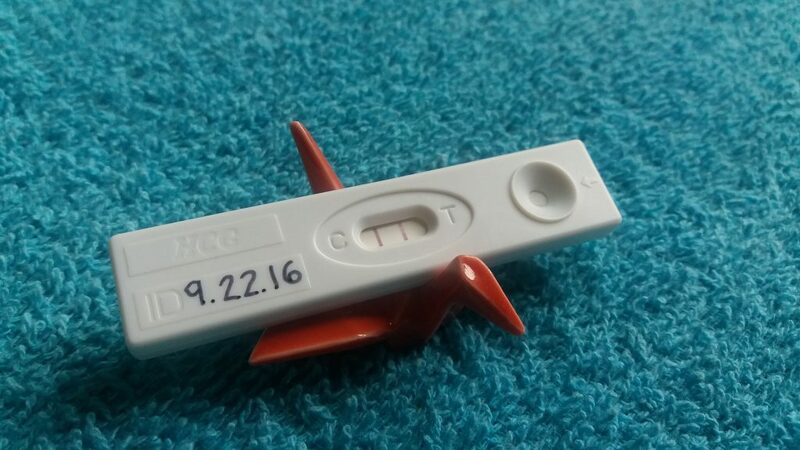 Lo and behold, when I took a pregnancy test last September 2016, I was already 6 weeks on the way 🙂 We were very happy! Then, it was time to prepare for the coming of the new baby. 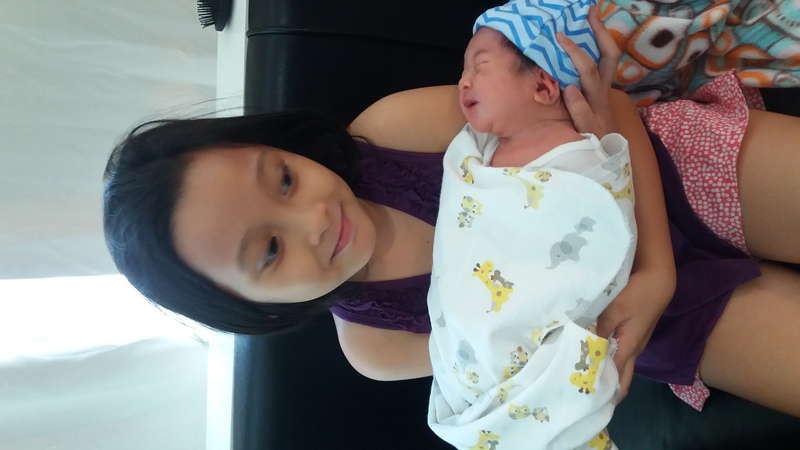 When we were still residing in my parents’ house in Las Pinas, our first-born Kelsea was born 2008 in Asian Hospital in Muntinlupa via emergency CS due to failure of descent. 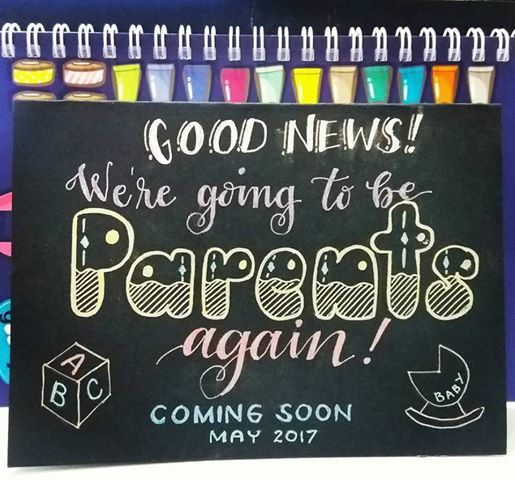 So I was thinking, does it automatically follow that since I had a CS before I should have elective CS for our next baby? Definitley no. It is a case-to-case basis. I learned from friends and support groups especially Gentle Birth in the Philippines and doula friends that I can be a candidate for Vaginal Birth After Cesarean (VBAC). So, I aimed for VBAC. 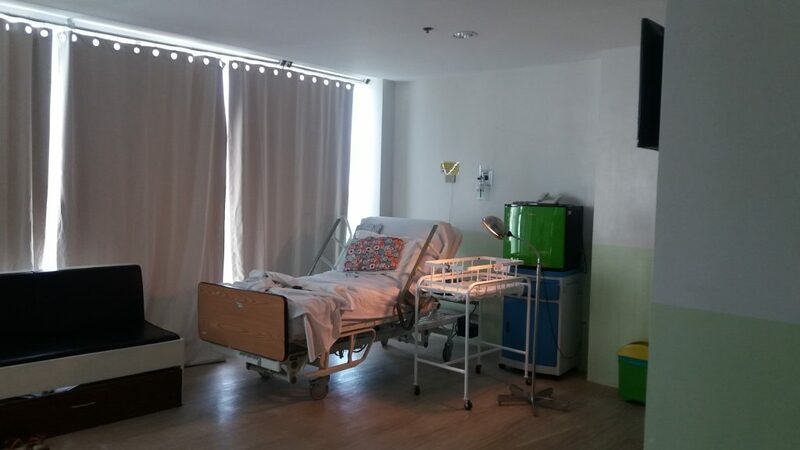 Since we are now residing in Cavite, we decided to change OB and hospital where I would be giving birth. 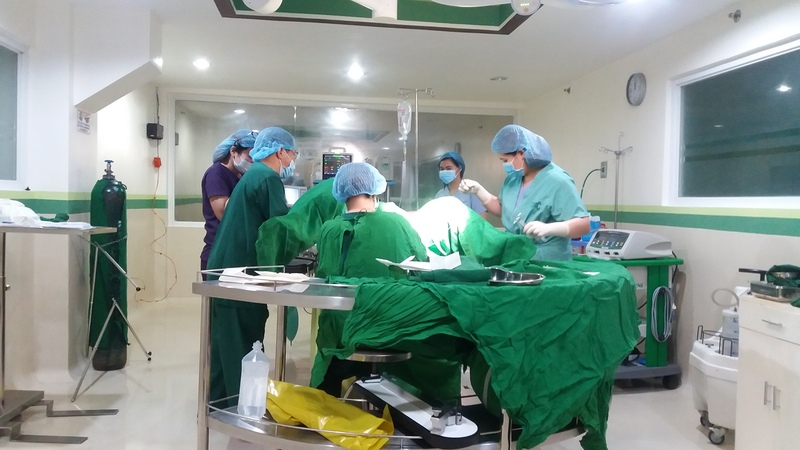 Bacoor to Alabang traffic is too much to handle and giving birth in Asian is too expensive for us now so we decided that I’ll be giving birth in Dasmariñas City Medical Center, a relatively new hospital which is only 5 minutes away from our house. The search to find a new OB is on, so I looked for recommendations and feedback from different groups. 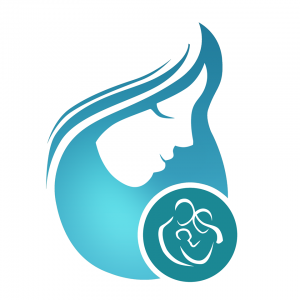 I prayed that I would find an OB that I would be very comfortable with and would support me althroughout my pregnancy until the time I give birth. I had morning sickness on my first trimester. Thanks to lemon ginger juice, it was bearable. I regularly go to my scheduled monthly check-ups after I fetch Kelsea from school. She always look forward to hearing the baby’s heartbeat. 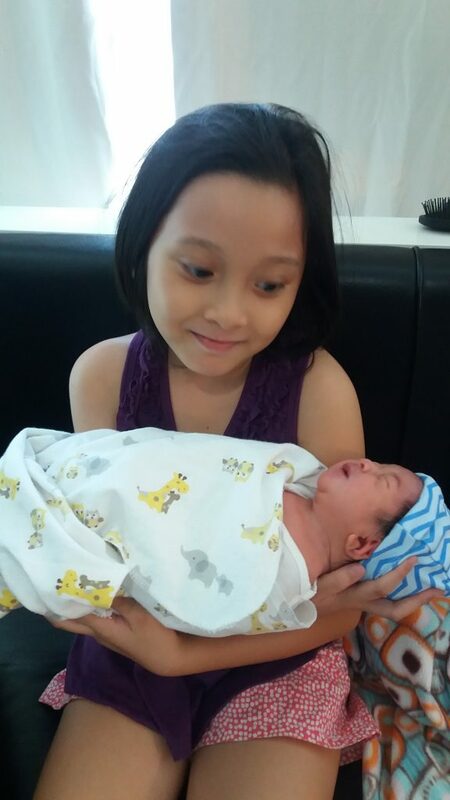 She wanted a baby sister and excited to be an ate 🙂 Unlike my previous pregnancy, this time I did not take pregnancy milk as it was the one that made me gain a lot of weight due to too much sugar. Instead, I took Calvin Plus for my calcium needs, Natalbes for multivitamins + minerals, and Folart and ate healthy food. There was also a time when I had spotting. It made us worry a lot so I had a checkup at once and was prescribed to take Progesterone. What else did I feel that time? Aside from being too sleepy, tamad na tamad ako kumilos! Plus my backache started to come in. Good thing I was able to buy a pre-loved snug-a-hug to make my sleep comfortable. On the second trimester during my 24th week, I was scheduled to have a Congenital Anomaly Scan (CAS). 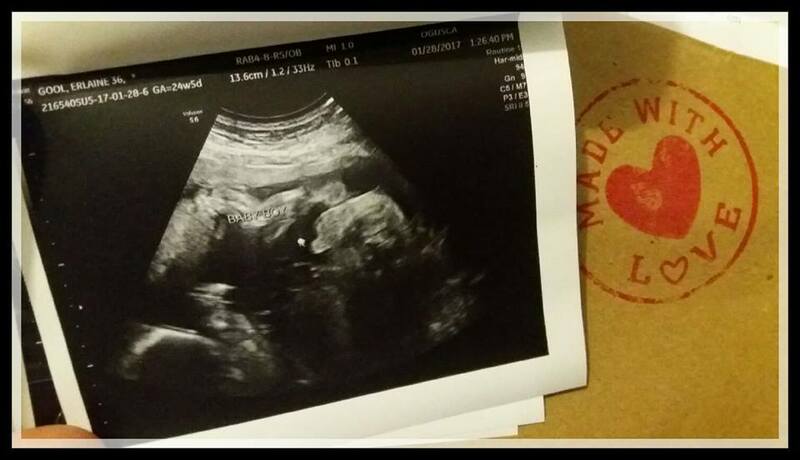 We went to OGUSCA Ob-Gyn Ultrasound Center in Festival Mall Alabang for the scan which costs Php 2,695. It is all God’s plan but we prayed that everything would be normal and it was. It was also the day we would know the baby’s gender. It’s a BOY!!!! Quota na hehe! But even if it was a girl, we already decided to have 2 children only. Any gender is ok for us as long as Kelsea will have a sibling. But deep inside I was also asking for a baby boy. Kelsea’s excitement lessen a little because she was expecting a girl. 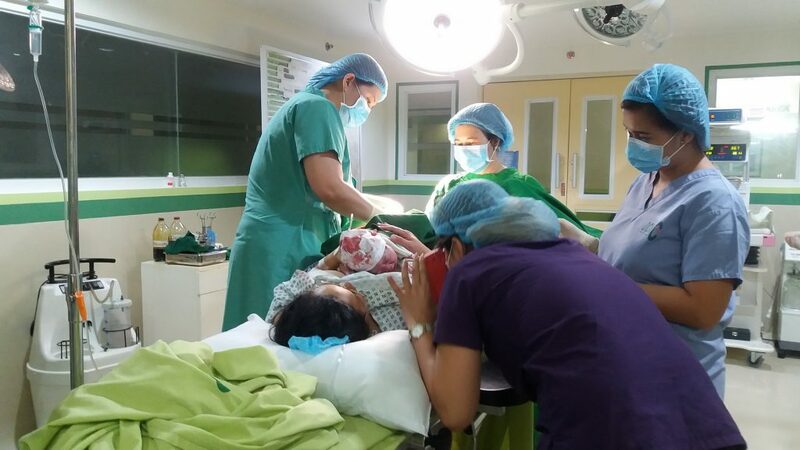 Baby was still in breech position that time but the sonologist informed us that there is still a lot of time that the baby will turn to the right position. Third trimester was all about preparing for the coming of the baby. I started buying stuff during my 7th month. Most were pre-loved clothes and only a few new ones. Thanks to family and friends for the hand-me downs. It saved us a lot of money. Practical na tayo ngayon. We also needed to declutter and clean-up to give space for the baby stuff. I presented this to my OB. 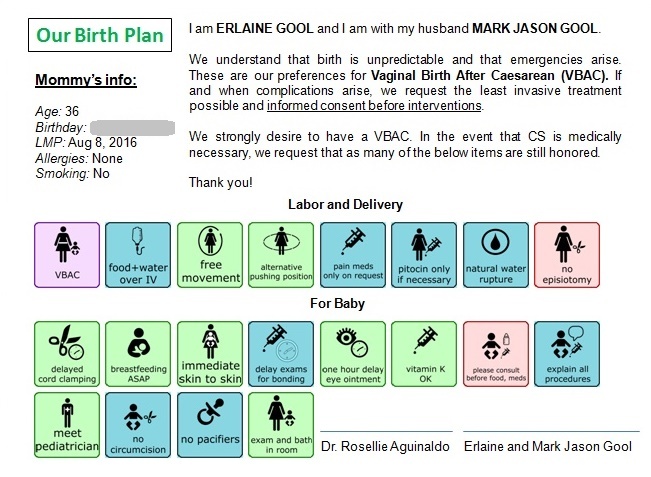 It was the first time she saw a “visual” birth plan (I got the template here) and agreed to it except for the episiotomy which may be necessary when needed. We both signed the birth plan and she attached it to my records. On my 8th month, I prepared the bags I needed to bring to the hospital. These are the: labor bag, husband’s (and Kelsea’s) bag, hospital bag and baby bag. As soon as I was on my 36th week, we already put them in our SUV that I would be driving in case the BIG DAY arrives. Yes, I was still driving with my big tummy to fetch my daughter until the school year ends and when going to my checkups. That was my MAJOR CONCERN. 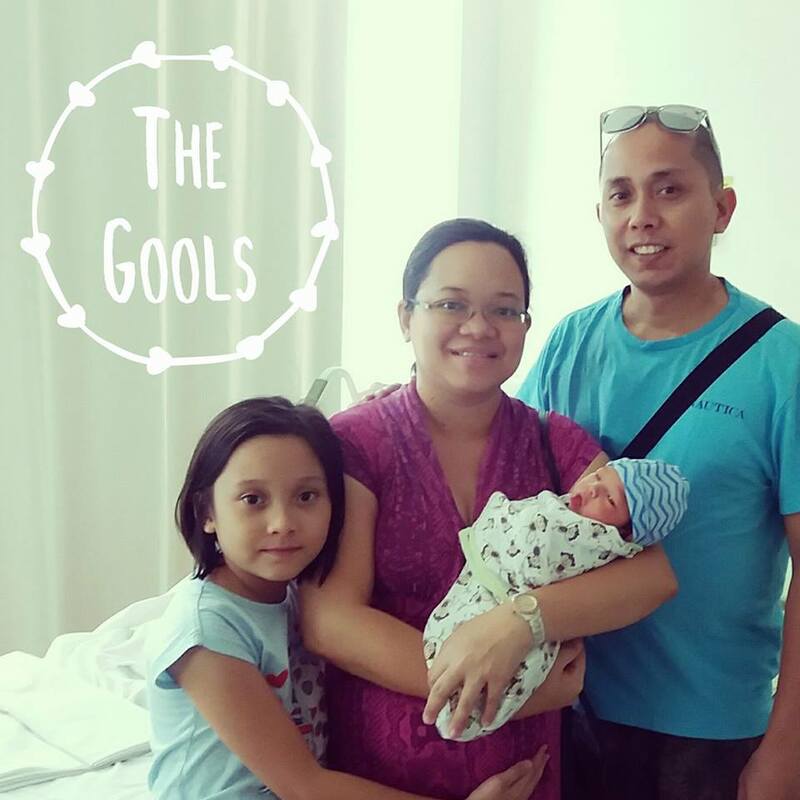 I was afraid to give birth without my husband around since he also needed to work in his office in Las Piñas. I was imagining myself having the contractions, dropping off my daughter to a relative’s house in the same village and then driving myself to the hospital. Kaya ko kaya habang humihilab ang tiyan ko? So, I was praying hard for the perfect timing. I prayed that when the big day comes, it will be at night or on a weekend when my husband is surely at home with us. 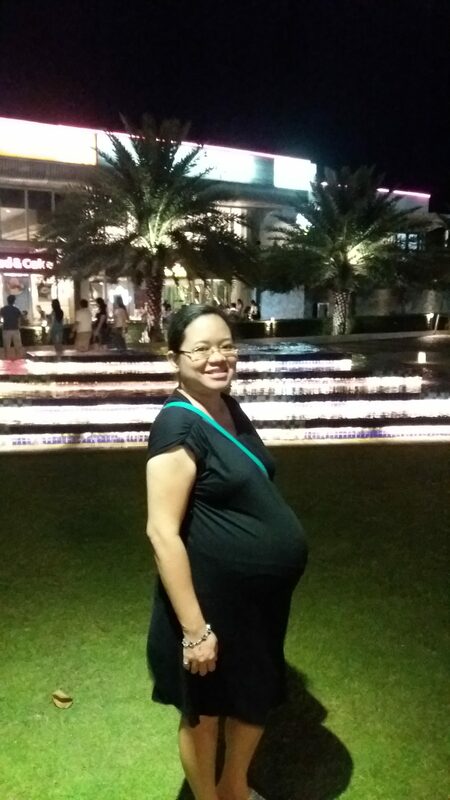 April 27 Thu (37weeks) – Yehey I’m on my 9th month and can give birth anytime. I went to my weekly check-up and my OB did an IE. I was already 4cm but still not feeling any regular contractions. So I drove home again. I’m really feeling very heavy. And because I’m on my 37th week, I have to make sure that baby is in optimum head-down position by reviewing the exercises from Binhi and Spinning Babies. I need to walk a lot, do my exercises especially my squats. I’m excited to give birth already but deep inside I was praying na wag muna because Kelsea’s summer painting class was still on-going. I still wanted to bring her to her class in our village every Friday and Saturday of April and May. 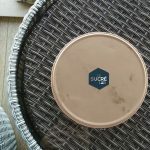 April 29 Sat – My mucus plug came out. Not bloody. I texted my OB to update her and just told me labor day is getting really near. But I just have to go to the hospital when there are already regular contractions. That night, Mark and I walked around the village while Kelsea rode the bike. I needed to do everything that I can for me to have a normal delivery. 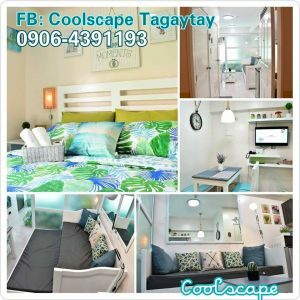 April 30 Sun – Because of the thought of having a new baby and will be missing the “three of us”, we decided to watch a movie in Evia. Guess what we watched? Boss Baby! 🙂 It was our last movie bonding before we became four. We had a great time. Can’t help but be emotional deep inside and kept hugging and kissing my first baby. I was a little afraid that our time together will surely lessen but I hope my love for her will still overflow even when her little brother arrives soon. Kelsea started coughing again. Lord, please don’t let her get sick and weak because I won’t be able to focus on her in case I give birth soon. Hello nebulizer again 🙁 Good thing Mark started working from home. I’m thankful he has a very understanding boss. So my worries became less. But in case Friday comes and I haven’t given birth yet, he needs to go to the office because of their weekly team meeting. This week went by and after-dinner was spent walking around the village. I was already having contractions from time-to-time but they are not yet regularly as I monitor them thru my mobile pregnancy tracker. I was waiting for a 5-6min interval in between contractions. But none yet. Intervals were still irregular at 10-13mins and then stops. 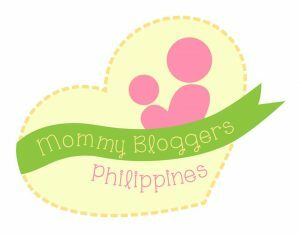 May 4 Thu (38 weeks) – It was my weekly checkup again. Since we’ll be in the hospital, we decided to have Kelsea checked too by a pedia. My OB recommended Dr. Job Mingoa to be the pedia of our baby so we decided to consult him regarding Kelsea’s cough and for us to meet him for the first time. 2pm – Arrived at the hospital and went to the pedia for Kelsea’s check-up. I didn’t drive this time. Mark went with us 🙂 We already informed Dr. Mingoa that we chose him to be our baby’s pedia as recommended by Dra. Aguinaldo. After the check-up, we went home since my OB’s clinic hours is 4-6pm. 5:30pm – Arrived at the hospital again (only 5mins away from our home). Waited in line since there were patients who arrived earlier than us. 6pm – It was our turn. My OB did the usual IE routine. 6cm na daw ako!!!! Mataas yata talaga ang pain tolerance ko. Looks like malapit na malapit na. 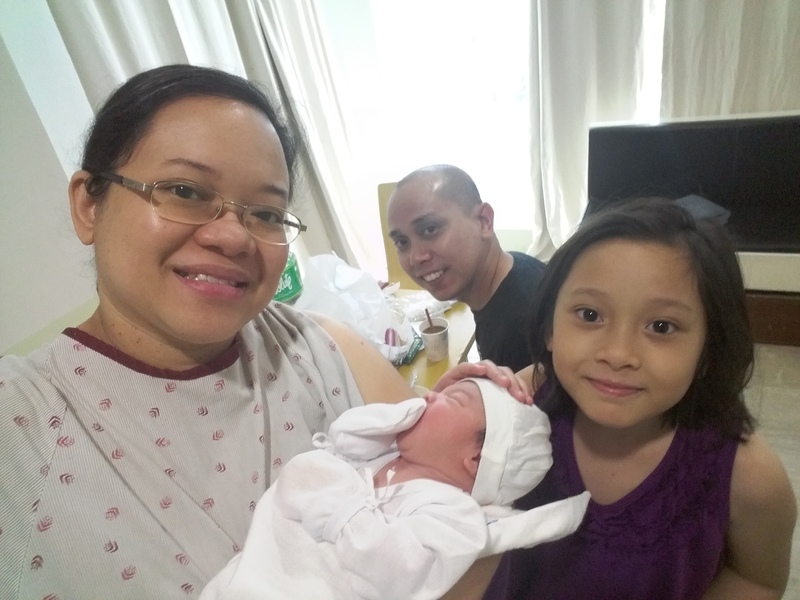 After the IE, I stood up and then suddenly the familiar sudden gush of water I felt during my 1st pregnancy was there. My waterbag broke!!!! This is it! TODAY is the day! 🙂 I felt mixed emotions. Biglang inalala ko ang breathing exercises ulit haha! 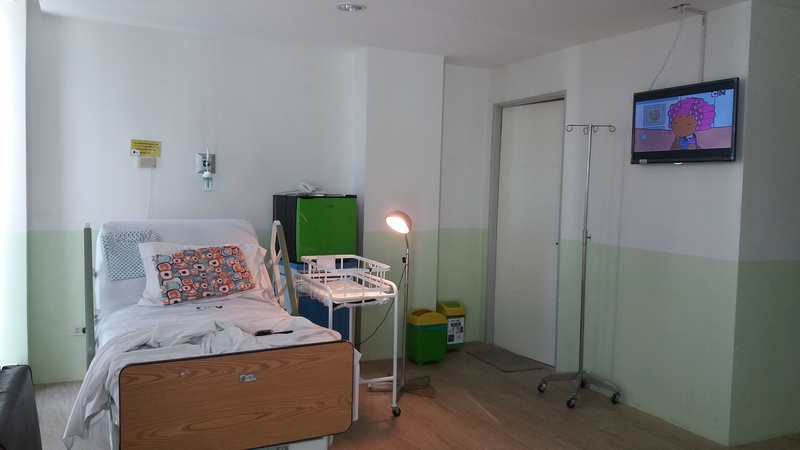 7pm – I was transferred to the labor room. Mark was not allowed to go inside. Husbands/partners, doulas or any companion is not allowed 🙁 That’s why I didn’t get the services anymore of my doula friends. Devices were then attached to me to monitor my baby and my contractions. Good thing there’s a television in the room to keep me entertained. Nurses then interviewed me. It made me happy that they were holding on to my birth plan. Hindi nga lang nasunod yung allowed to eat and drink since I’m already on IV. And I can’t be in any other position to ease the pain. Ang sakit sakit na ng likod ko. Doing na breathing exercises that time. I appreciated the nurse there because she saw me massaging my back every contraction and told me she’ll do it. 8pm – I was 7cm but my blood pressure is still high. I told Mark thru text na magdinner muna sila ni Kelsea. Yes, I was allowed to bring my celfone and powerbank inside 🙂 My OB then told me that she wants to sedate me so I’ll be relaxed. I put my trust on her so I said ok. Pinipilit kong huwag makatulog pero ang hirap pala labanan. Being sedated for 2 hours normalized my blood pressure. Do I want or need an epidural? I declined. I had an epidural on my first pregnancy. It helped me with the pain but it did not help me push. So this time, I wanted to go naturally without medications. I was always thinking of my goal to do VBAC. Kakayanin ko ito! Think positive lang and prayers pa more! The anesthesiologist was just on standby. 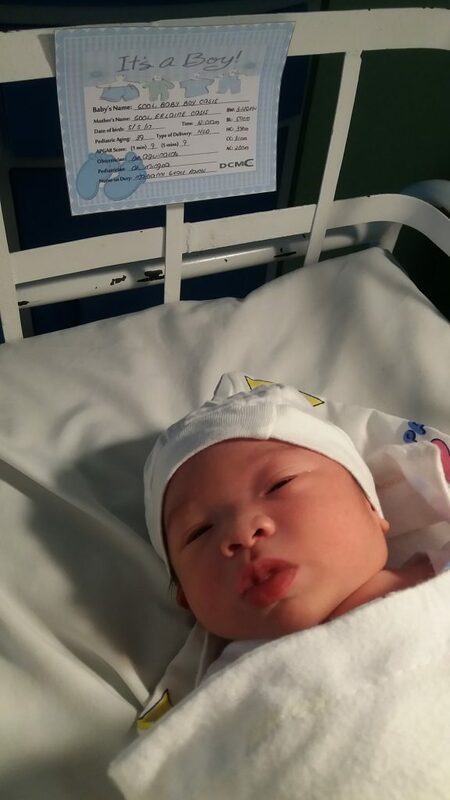 10pm – I was brought to the delivery room. I think I was 8cm or 9cm that time. Grabe na ang sakit ng contractions. Practice breathing na kami for pushing. My OB and the resident OB were coaching me on the right timing of breathing and when to push. Anesthesiologist still on standby in case I ask for anesthesia. A little past 11pm – 10cm na! GAME Na! Pushing time and I need all my strength. I remember I was so thirsty but not allowed to drink. My lips were so dry. I requested the nurse if she can put wet cotton on my lips. It was granted naman. The pain I felt was so intense. Ang sakit pala ng walang anesthesia!!!! Kaya ko ito! When contractions came, inhale-exhale fast for 2 times then on the 3rd inhale, hold and then PUSH!!!!! I also remember telling the resident OB who was beside me na “pagod na pagod na ako!” every after push. I think I said that around 3 or 4 times. And she kept telling me na I can do it and malapit na si baby. 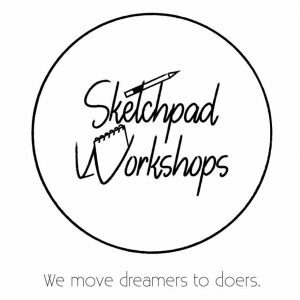 I can’t remember kung pang ilang push ko na but when they told me na isang malaking push na lang, I gave it all my strength. At 12:01am of May 5, 2017 Friday, our baby boy Zane Johann was born. All the pain went away in an instant. It was replaced with pure joy and happiness. Ang sarap ng pakiramdam maging ina muli!!!! And the feeling of experiencing an unmedicated normal delivery. Feel na feel ko ang pagkababae 🙂 I want to give myself a medal for a job well done lol! I had an episiotomy. I guess I didn’t practice much my kegels. And because I’ve already experienced the greatest pain of giving birth, I did not bother anymore taking anesthesia while I’m being stitched. I was still in awe that I was able to reach my goal. They let me stay at the recovery room for 2hrs and let me breastfeed Zane. I didn’t know if I already had milk at that time but I’m confident that soon my colostrum will come out for my baby. I’m new again when it comes breastfeeding so I have to prepare for the battle hehe. At 2am, I was brought to our room. Then Zane also was roomed-in which is already a protocol in all hospitals as long as the baby does not have any complications. Here is our first family picture a few hours after Zane was born. Breakfast time! I was sooooo hungry!!! 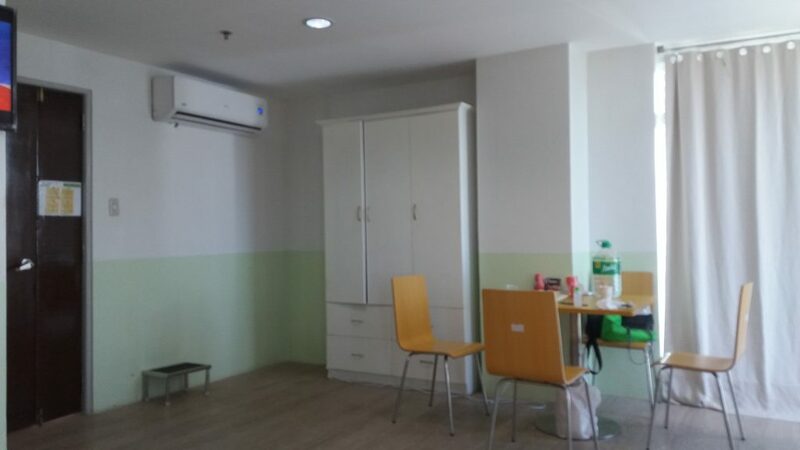 I love the room that we got because it is so spacious and not expensive at only P 2,015 per night. It has a TV, small ref, cabinet, bathroom, small dining area and a sofa bed with pullout bed. 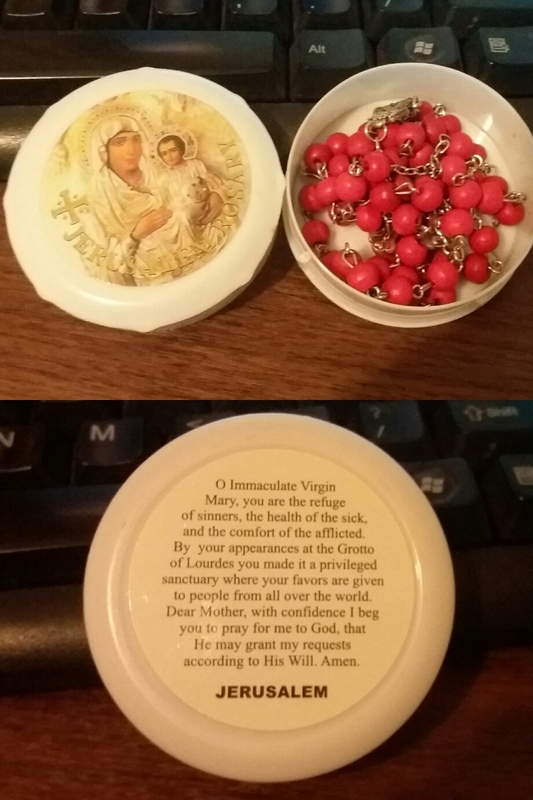 It also comes with an admission kit. The NICU also provided the first clothes for the baby, baby blanket and a baby kit (includes a thermometer, alcohol, cotton, a pack of newborn diapers). We were not allowed to bring our own pillows so we just ordered an extra pillow (Php250) for Kelsea. We had a comfortable stay in our room. Both our families visited us at once because they were so excited to see Zane. Visiting hours is from 9am to 9pm. 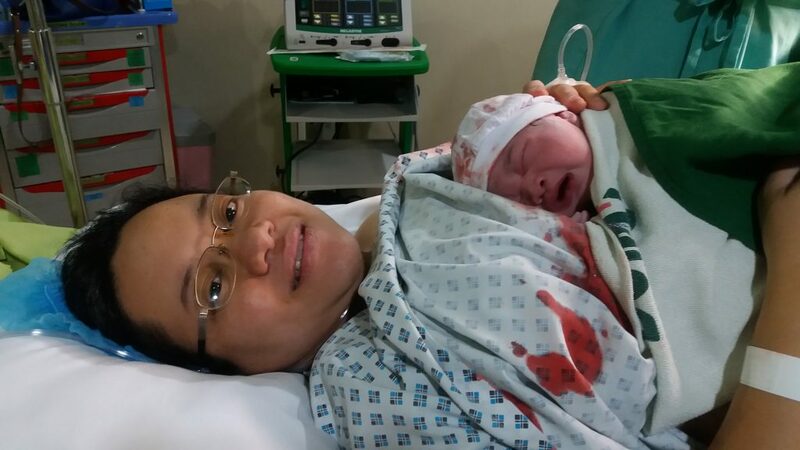 I was relieved that I had a normal delivery because I can easily move around unlike when I had a CS. 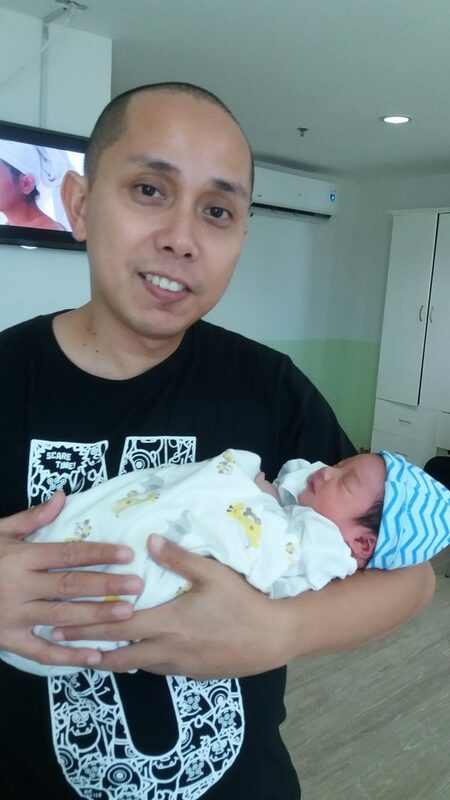 The next day, May 6 (Sat), we were already cleared by the pedia and OB and allowed to be discharged. Thank you to my OB Dra. Rosellie Aguinaldo, our pedia Dr. Job Mingoa, my stand-by anesthesiologist Dra. Mary-Kris Tiu who documented Zane’s birth by giving us 2 Instax pics as souvenir, and all the nurses and hospital staff who took care of us. 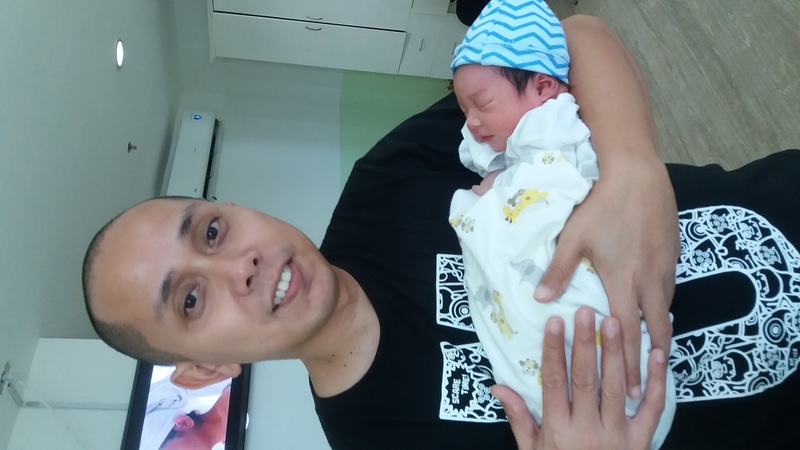 Thank you to Pinay Doulas Collective, my VBAC friends and to our family and friends who supported us along the way and prayed for my safe delivery. 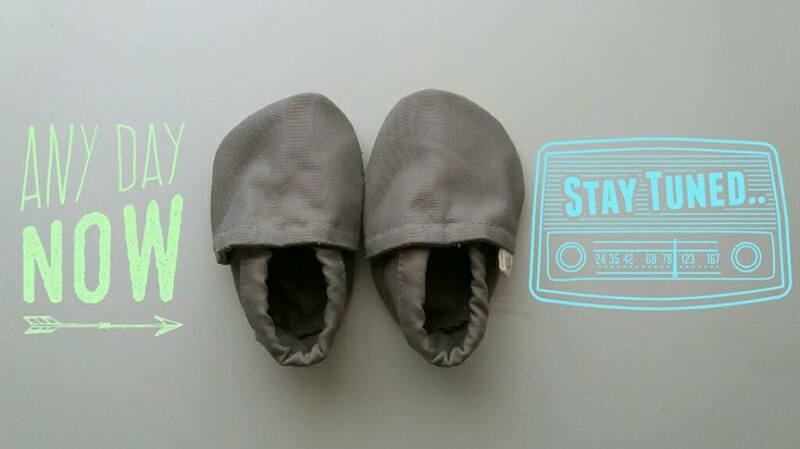 Enter your email below to receive updates from Glamma Momma. 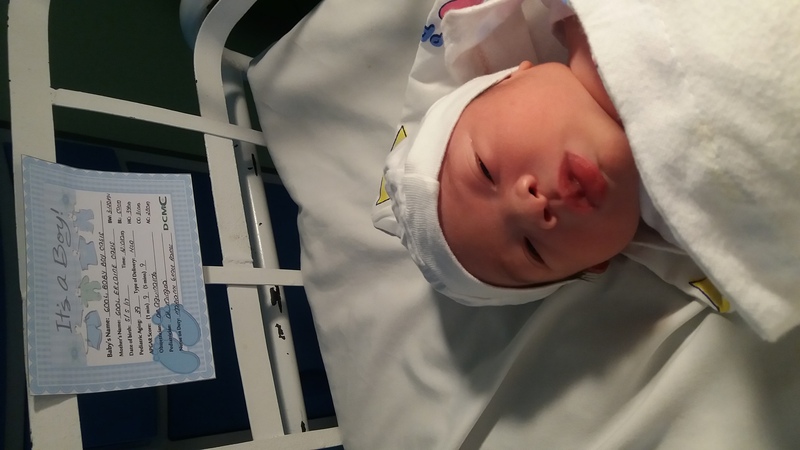 Meet our newborn baby, Zane!